KUALA LUMPUR: The second wave of floods ravaging the country has worsened, sending 58,705 people in six states to evacuation centres as of this morning. A headcount showed that Kelantan had the most number of evacuees, at 24,765, followed by Terengganu (21,606); Pahang (10,825); Perak (1,030); Sabah (336) and Perlis (143). In KELANTAN, the number of evacuees rose by 3,164 overnight from 21,601, forcing the opening of 18 more relief centres to take the total to 114 today. The floods in the state have affected nine of the 10 districts, namely Gua Musang, Jeli, Kuala Krai, Machang, Pasir Mas, Pasir Puteh, Tanah Merah, Tumpat and Kota Baharu. Pasir Mas has the most number of evacuees, at 8,754, followed by Gua Musang (5,259) and Kuala Krai (4,608). In TERENGGANU, 8,977 more people were evacuated overnight, raising to 21,606 the number of victims in the state. 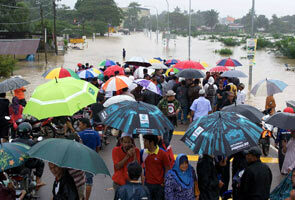 Kemaman is the worst-affected district, with 12,699 evacuees. The high-tide phenomenon has been blamed for the big number of evacuations, particularly along the coastal areas, according to the portal of the Terengganu National Security Council. As of 9am today, the Dungun district had 4,591 evacuees; Hulu Terengganu, 685; Kuala Terengganu, 3,086; Besut, 426; Marang, 11 and Setiu, eight. They are being housed at 107 relief centres. The levels of several major rivers in Terengganu are reported to have exceeded the danger point. The level of Sungai Dungun at the Jerangau Bridge was 14.21 metres (danger point 12.50 metres); at Kuala Jengai, 26.33 metres (21 metres); at Pasir Raja, 38.62 metres (37.50 metres). In PAHANG, 4,539 people in eight districts were moved to relief centres this morning, taking the total number of evacuees in the state to 10,825. A spokesman of the Pahang Police flood operations room said Kuantan was the district with the most number of evacuees, at 6,231, being housed at 31 relief centres. Maran was next with 2,542 evacuees, accommodated at 15 centres; followed by Lipis, with 722 evacuees at 11 centres; Pekan, with 553 evacuees at seven centres; Jerantut, with 487 evacuees at seven centres and Rompin, with 268 evacuees at two centres, he said. The spokesman said stretches of several major roads had been closed to all vehicles, among them Jalan Kuantan-Sungai Lembing (near the Sungai Riau Bridge); Jalan Kuantan-Sungai Lembing (at the Panching intersection); Jalan Jerantut-Lipis; Jalan Jerantut-Kuala Tahan and the stretch at Km42 Jalan The levels of several major rivers in Terengganu are reported to have exceeded the danger point. The level of Sungai Dungun at the Jerangau Bridge was 14.21 metres (danger point 12.50 metres); at Kuala Jengai, 26.33 metres (21 metres); at Pasir Raja, 38.62 metres (37.50 metres). A spokesman of the Beaufort District operations room said the evacuees in Beaufort were being housed at a community hall. In PERLIS, the number of evacuees from Beseri, Padang Melangit and Tasoh rose to 143 from 104 last night. The telemetry system of the Perlis Department of Drainage and Irrigation indicated that the level of water at the Timah Tasoh Dam was 29.78 metres, slightly higher than the danger point of 29.60 metres.